Zoe Carter’s busy life on the West Coast with her husband and daughters takes an unexpected detour when her glamorous, independent-minded mother, Margaret, tired of living with Parkinson’s disease, decides she wants to “end things.” As Zoe and her sisters negotiate over whether or not they should support Margaret’s choice and who should be there at the end, their discussions stir up old alliances and animosities, along with memories of a childhood dominated by their elegant mother and philandering father. 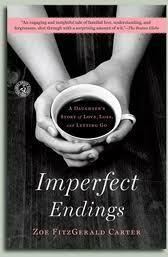 Capturing the stresses and the joys of the “sandwich generation” while bringing a provocative new perspective to the assisted suicide debate, Imperfect Endings is the uplifting story of a woman determined to die on her own terms and the family who has to learn to let her go. Zoe FitzGerald Carter is a graduate of Columbia Journalism School and has written for numerous publications including New York magazine, The New York Observer, Premiere, and various national magazines. Imperfect Endings is her first memoir. It won first place in the 2008 Pacific Northwest Writer's Association's literary contest and was a finalist at The San Francisco Writer's Conference. Zoe lives in Northern California with her husband and two daughters. This is such a heartfelt and beautifully written story about the author and her mother's determination to end her life on her terms. I couldn't imagine that anyone could put into words the grief and anguish that must have occurred when Carter's mother announced she was determined to no longer live with her debilitating health. Carter does an excellent job bringing forth her mother's strong personality and background so that you can understand the history and reasons behind her mother's actions. I really felt that the author chose the high road and tried to look on the positive side of things by reminiscing about her childhood and her parent's background so that you could really understand why her mother was determined to go through with assisted suicide. There are quite a few important points brought forward by this book that will become even more in import to people in the future as more of us start to age. Carter's mother always determined her own fate and wanted to end her life when she felt she should go, not when her body was actually done living. After recently losing my mother to cancer quite quickly, I can see that if my mother had the time, I think she might have chosen this method as well. I know that I would like to keep this option open for myself. I can see why this book might not be popular with a lot of people, but it will bring about some very important questions about the quality of life and what it truly means to control your own destiny. This sounds good! Another TBR! I also really like your "Leave your comment" note! Karma is everything!! Wow. Sounds like a really amazing book! The topic of death is always hard to swallow, not even mentioning to write a book about it. And to write a book about assisted suicide is something even harder to do, especially since it's a very personal story. Thank you for your review, I will try and find this book in the library next time I visit.